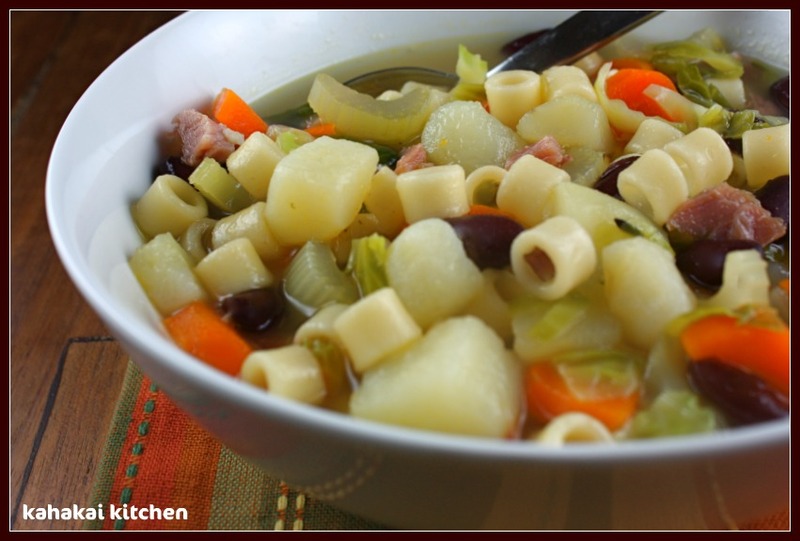 The clean-out-the-pantry soups that I throw together are often my favorites. This Smoky Minestrone made the most of the last of the smoked turkey drumsticks and organic chicken stock in my freezer and some fading vegetables from the fridge bin. 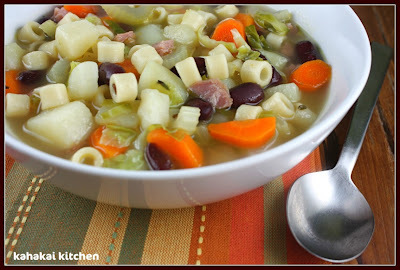 Add some herbs, canned kidney beans and ditlanani pasta from the cupboard and a savory soup was born. I tossed this together before my friend Rene' arrived for a long weekend visit from Seattle, and although I don't force my house guests to eat soup, ;-) it hit the spot after a long day of beaching it on the North Shore and she proclaimed it delicious. Place smoked turkey legs in a large soup pot and cover with 4 cups of water. Bring to a boil and simmer for about 30 minutes. Add carrots, celery, potatoes, garlic, rosemary, thyme and bay leaves along with the chicken stock and return to a boil. Reduce heat and simmer for about 25 minutes, until vegetables are mostly cooked through. Remove turkey legs and allow to cool slightly. Add the pasta, kidney beans and Brussels sprout leaves to the soup and cook another 5-7 minutes. Meanwhile, remove turkey meat from drumsticks and chop into small pieces. Return turkey to the pot and warm through. Stir in smoked paprika and season to taste with salt and pepper. Serve with a little freshly grated Parmesan if desired. Notes/Results: A very flavorful broth from the smoked turkey legs, chicken stock, herbs and paprika made for a hearty and delicious soup. I liked the shredded Brussels sprouts in the mix--a little like cabbage. We tried it on top of some chopped spinach with some freshly created Parmesan and it made a great meal. I would make this again. We have a couple of friends in the Souper Sundays kitchen this week--let's take a look. 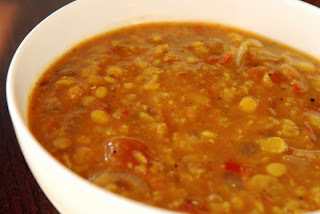 Janet from The Taste Space has a lovely Mixed Lentil and Tomato Stew to share and says, "I originally spotted this recipe on The Wednesday Chef, as a Two Lentil Stew that she adapted from Flatbreads & Flavors when I was looking for more recipes with chana dal. In the comment section, though, it turned out it was actually a Five Lentil Stew that she had modified… and I had 4/5 of the beans: red lentil, chana dal, mung dal and toor dal. Not too shabby if you ask me, with only urad dal as the missing ingredient. And since they are all split beans, this stew cooks up quickly. The mixture of beans in this stew creates a glorious effect. Some turn to mush, others keep their shape, more are half-way in between. The texture is unbeatable." My friend Heather of girlichef had two soups this week. First up, she and I shared our smoky bean love this week and she has this delectable Smoky Yellow Bean Soup. She says, "So, though time marches on, some things never change. Like my love for beans and pork together. They are just the perfect match. I used Yellow Eye beans for the first time to make a big pot of soup that, when combined with some savory smoked pork necks and the slow heat of smoky chipotles, formed a big bowl of comfort that we didn't want to stop eating. While I served it with some Seeded Mixed Brown bread the first day (and thoroughly enjoyed it), we greedily devoured it the second day. Why? Well, because the beans had begun to break down a bit and thicken up the soup and the smokiness of the pork and chipotles intensified, as did the heat." 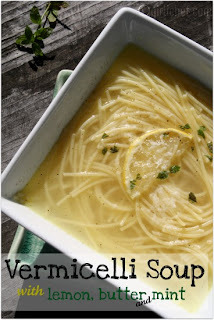 girlichef also made this comforting Vermicelli Soup with Lemon, Butter, & Mint about which she says, "So with the sun warming the house through windows with the curtains thrown back, I decided it was the perfect time to catch up on a few of my shows waiting, anxious to be watched, in the DVR. Since midday was in sight, I stopped in the kitchen on the way to the television. It doesn't get much quicker than a brothy bowl full of simple noodle soup. Within 15 minutes I was curled up with a steaming bowl to watch the season premiere of The Next Iron Chef. Simple is good." Short but sweet roundup this week.Thanks to Heather and Janet for joining in. 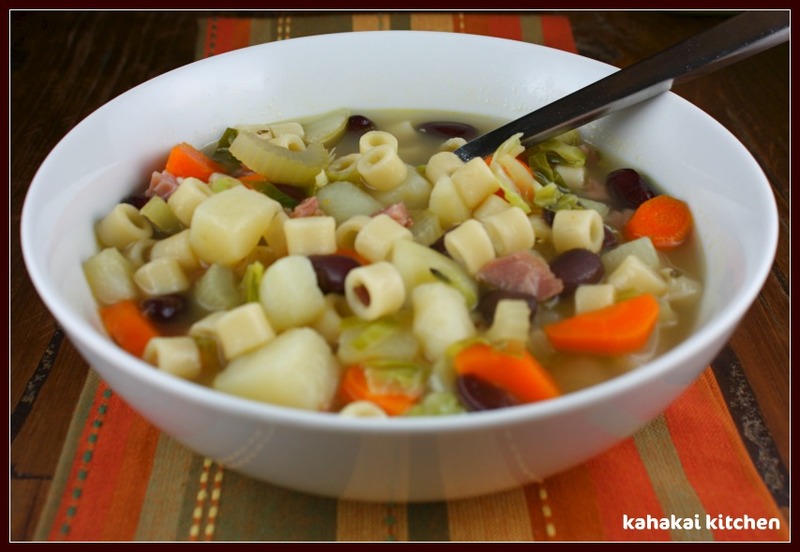 If you have a soup, salad, or sandwich that you would like to share, just click on the Souper Sundays logo on the side bar for all of the details. Souper Sundays is posting a couple hours before the normal 12:00 PM Hawaii time deadline as there is sun and a house guest so we are of to explore and hang out. If there are any last minute entries, I'll add them when I return later today. 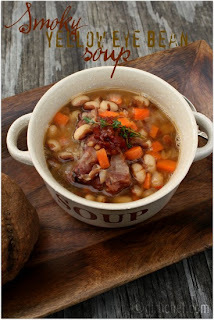 Loved the look of the smoky yellow bean soup; round up sounds delicious! 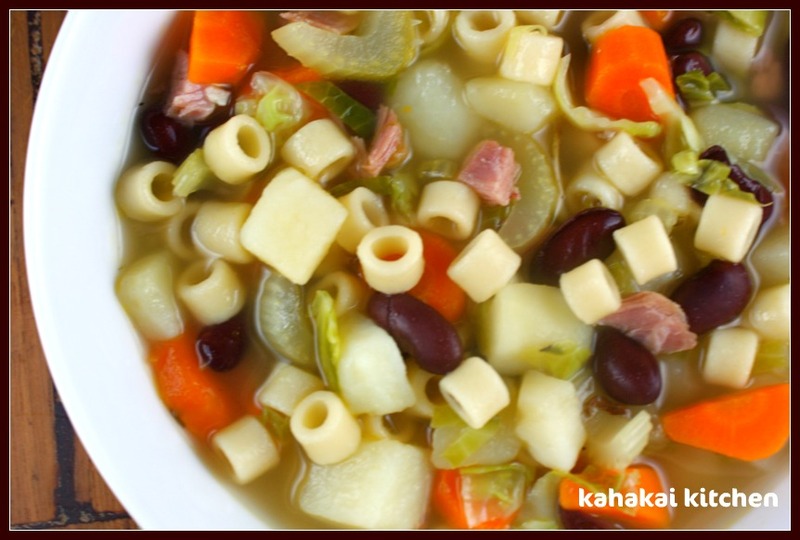 Minestrone is the kind of soup that you want to curl up with...it's just so comforting and full of down-to-earth goodness! Fabulous round-up as always! At least you recorded your creation. Most of my pantry clean out recipes can never be duplicated.